c1092. Dr. L.C. Dunn, Professor of Genetics, Columbia University, New York, a member of the Advisory Committee on the Eugenics Record Office. Copy received by H. H. Laughlin August 1, 1935. 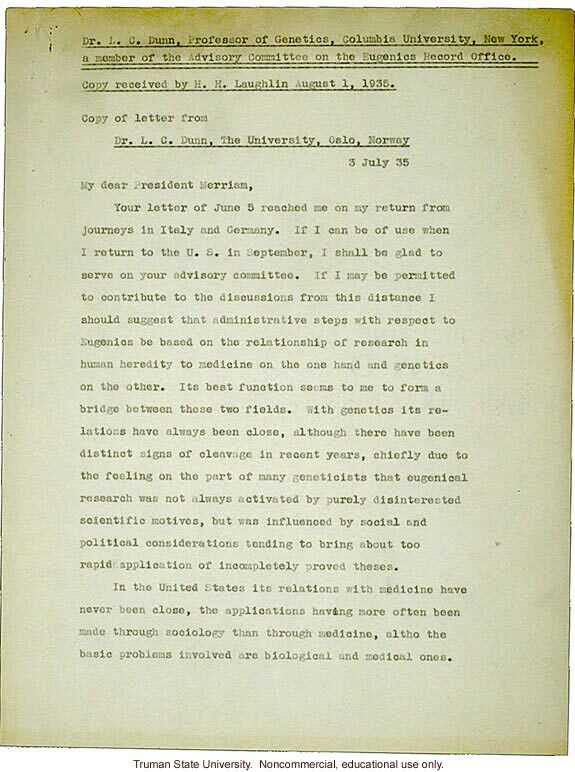 Copy of letter from Dr. L. C. Dunn, The University, Oslo, Norway 3 July 35 My dear President Merriam, Your letter of June 5 reached me on my return from journeys in Italy and Germany. If I can be of use when I return to the U.S. in September, I shall be glad to serve on your advisory committee. If I may be permitted to contribute to the discussions from this distance I should suggest that administrative steps with respect to Eugenics be based on the relationship of research in human heredity to medicine on the one hand and genetics on the other. Its best function seems to me to form a bridge between these two fields. With genetics its relations have always been close, although there have been distinct signs of cleavage in recent years, chiefly due to the feeling on the part of many geneticists that eugenical research was not always activated by purely disinterested scientific motives, but was influenced by social and political considerations tending to bring about too rapid application of incompletely proved theses. In the United States its relations with medicine have never been close, the applications having more often been made through sociology than through medicine, altho the basic problems involved are biological and medical ones.